I Have been working on lots of new sparklers with the beads and wire and findings that I acquired last month. I love the process of matching beads and wrapping them all up together to form wearable art. These are some Victorian style bracelets that are great fun to make and wear. I have done some up in gold and silver wire and many different colors of swarovski crystals. As Miss Hannigan says they "shine like the top of the Chrysler building". This amber pendant is absolutely delicious. Amber is such an amazing organic material. It has a multitude of colors, can be pressed into a variety of shapes and although it looks substantial it is very light to wear. 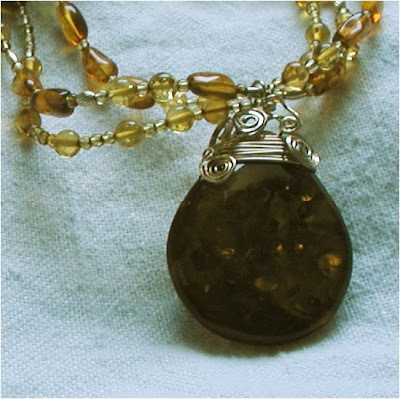 This teardrop pendant was wrapped in gold wire and hung on a multiple strand necklace of amber beads in lemon and honey colors. Perhaps my favorite to date are these hoop earrings that I hammered silver wire to create. The drops in the center are lemon quartz. The piece was then oxidized and polished to its lovely smoky color. They sold the day after I finished them so I must make more. Hello, I love all your jewelry.This is my begining, I'm learning all the time. I saw your gallery and your work made huge impression on me. Thank you for your kind comments. I visited your site also. 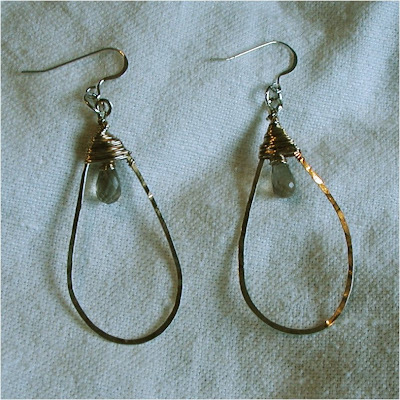 I love the earrings that you have made, especially the gold spiral beads with the wire and bead wrap.